On the centennial year of one of the world's most prestigious fashion houses, Ermenegildo Zegna, we speak to the man himself on the brand, its history and ethos. M: Zegna completes a hundred years as a family business this year. What sets your brand apart? Ermenegildo Zegna: Our priority has always been the investment in product quality and in our people. The vertical organisation of the Zegna Group, where we are in control of all stages-from raw materials to the point of sale-has stood us in good stead. A pivotal point in our growth was our pioneering investments in emerging markets such as China and India from 1991. M: The brand has always been synonymous with great fabrics, and this year you're bringing out your "centennial fabric". What is it? Zegna: It is a commemorative reproduction of the first fabric produced by Lanificio Zegna in 1910. "Fabric No. 1", as it was called, was designed by Ermenegildo himself where he sketched every individual weft and waft in his notebook. This first Zegna fabric, created in 1910, weighed 500 gram per metre. Today, thanks to 100 years of fabric innovation, the 2010 commemorative version has been recreated in "15milmil15" superfine wool, weighing just 270 gm/m. M: What is the quintessential Italian style that you bring to your clothes? Zegna: I would say our four cornerstones: Quality, masculinity, contemporary style & innovation. M: How has the company's experience been in India thus far? Zegna: For October-December 2009, our business grew at high double digit over October-December 2008. This stellar growth has happened even though luxury destinations still have a long way to go in increasing traffic and getting the right tenancy mix organised. We have seen that the right combination of service and product offering creates a winning formula for our business in India. Our existing three stores in Mumbai, Delhi and Bangalore will be complemented with new openings in Hyderabad and second stores in the key cities of Mumbai and Delhi in the near future. M: Do you think the market in India for menswear has matured? Zegna: India, like any other emerging market, is characterised by the continuous evolution of style consciousness among men. Our market comprises both the traditionally rich and sophisticated Indian consumer on one hand and the new urban Indian upper middle class that feels the need to imbibe style and quality. M: Last year, you shot your advertisement campaign in India. How was the response? Zegna: We chose India because it offered us a fantastic background to portray our vision of inspiring interest and appeal for different fascinating cultures. This has been achieved, giving us a distinctive image among the luxury environment. In particular, the Indian atmosphere translated into the Zegna Collections has had a very strong acceptance among our global clients, especially for those deliveries related to full summer garments. M: What are the launches you are planning for this year? Zegna: Starting from mid-July, we will deliver a unique wardrobe inspired by "Fabric No. 1". Along with this, we shall also present suits in superfine wool, retro style shirts in cotton and silk, ties and scarves with the centennial crest. To complete the wardrobe, travel and business soft bags, high performance shoes and leather accessories detailed by the centennial selvedge will also be there in the product line. A luxury limited edition collection will be also presented, starting from May. The most precious and superfine Centennial Vellus Aurem fabric will be available for a limited made to measure specific programme. 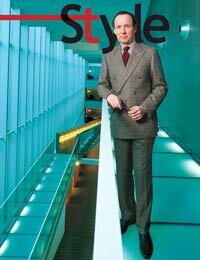 M: Finally, is the next generation of Zegna being primed to take over the reins of the business? Zegna: We favour the entry of new generation members in to the business, provided that they have the passion and they meet the criteria that the family company has established. Television in the third dimension?